A four-metre reptilian man-eater has been sliced and diced before hundreds of enthralled and disgusted members of the public at Charles Darwin University (CDU). Vomit bags were handed out as a precaution, with the assembled audience members being warned by one of the team prior to the cutting that the smell up at the mouth was "nothing" compared to what was in store once it was really opened up. 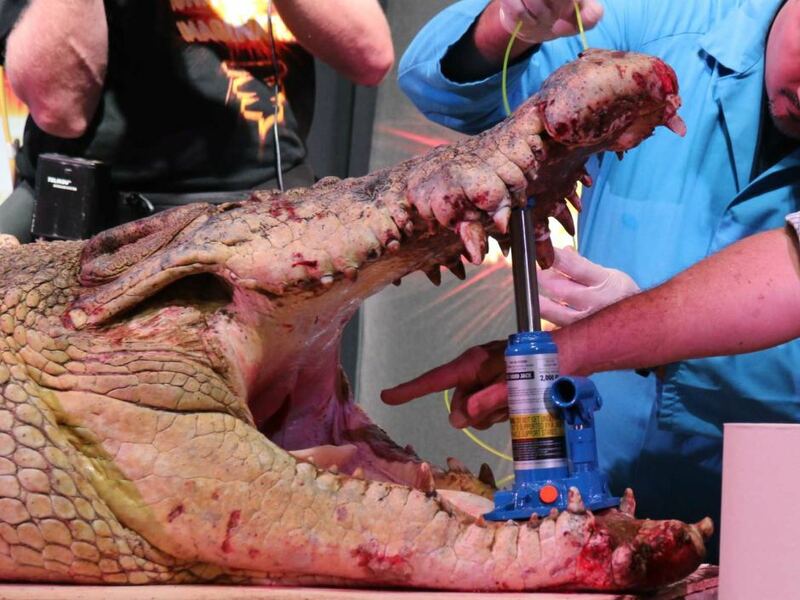 The saltwater crocodile was a donation from the Top End's Crocodylus Park tourist attraction and research centre and was sliced open before a live audience as part of National Science Week. "They're very interesting ... and they've got a number of features that you don't find in other animals," said George Lambrinidis from the CDU Tertiary Enabling Program. "For example, the blood-supply that actually takes blood away from the lungs rather than to the lungs in some instances," he said. As a pneumatic jack was inserted into the animal's mouth to keep it agape, Dr Grahame Webb explained how - despite the immense power of its downward thrust - a croc's jaws could be kept shut with relative ease. "The muscles are for closing the jaw, not for opening ... you can tie a croc's jaws closed with a piece of string and it's had it," he said. "It is designed to lock its head onto whatever it is grabbing. "When it locks on, it just hangs on ... it doesn't matter how much an animal struggles."